What is injury to the AC joint? The acromioclavicular (AC) joint refers to the meeting point of the clavicle (collarbone) and the scapula (shoulder blade). This is held together by ligaments, and stabilized by the surrounding muscles and tissues. Injury to this joint is referred to colloquially as “shoulder separation”. This is actually a misnomer, as it is not the shoulder joint (humeral head within the glenoid fossa) itself that is separated, but the AC joint. Damage can cause the ligaments holding the joint together to separate, causing the bones to misalign. Patients will complain of pain in the shoulder, and a visible deformity, such as a bump in the shoulder, can be seen. How is injury to the AC joint classified? Grade I injury involves minimal damage to the ligaments of the AC joint. The shoulder is painful, but there is no visible deformity. Grade II injury refers to the partial tear of the ligaments of the AC joint. This shoulder is painful, particularly during movement and manipulation. Grade III injury refers to a complete tear of the ligaments of the AC joint. This causes complete separation of the clavicle with the scapula, which causes a noticeable deformity. Severe pain is associated with injury of this grade. 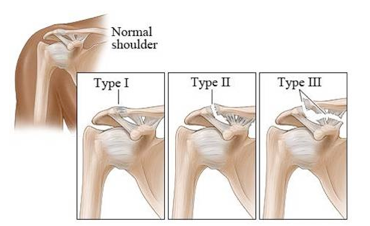 Separation of the AC joint can be caused by impact on the shoulder, such as from falls. Directly falling on the shoulder is one of the most common causes of shoulder injury. The force of the impact can tear the ligaments of the AC joint, causing separation. How is AC joint injury treated? A diagnosis of AC joint injury is based on the history and physical examination. The physician may request additional examinations, such as X-rays, or MRI scans. The initial treatment of shoulder separation should be to immobilize the joint. This will prevent further aggravation of the injury, and will stabilize the injured shoulder. The patient’s arm is to be kept in a sling held close to the body. Placing a pillow between the arm and the torso will both provide support and afford relief to the patient. Cold compress should be placed on the injured shoulder for at least 15 minutes every three to four hours for the first two days to help minimize the pain and swelling of the shoulder. Medications such as non-steroidal anti-inflammatory drugs (NSAIDs) can be given to relieve pain and inflammation. Most cases of shoulder separation can be adequately treated with immobilization of the joint. NSAIDs can be given to minimize the pain and discomfort of the patient, and warm compress can be placed every three to four hours to promote healing and relieve pain. Recover may take anywhere from three weeks to months after the injury. When shoulder mobility is restored, it is recommended that patients under a program of physical therapy and rehabilitation to strengthen the shoulder joint and condition the supporting muscles.